providence(n): the care and kindness of God or fate. May providence keeps our heart true when we are faced with the trials of life. A wallpaper I did back in February for Lunar New Year. The idea for the title "Providence" actually comes from my interpretation of RK story. 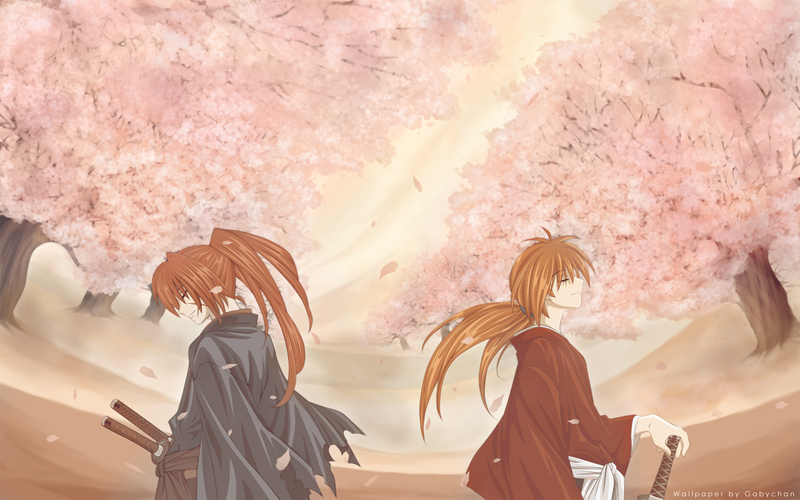 I wanted to show how Kenshin is guided by providence in his life. Starting from when he was saved from the slave traders as a child, how he took up the sword and became the assassin that aid the formation of the Meiji era, his life after the revolution as a wanderer, and how he finally settle down to live a peaceful life. Also I intentionally flip the images. No, I didn't forget that his scar is on the left side when I flip the scan. I did it so because I wanted the older Kenshin to be scar-less. It gave the illusion how he has healed himself from his past. The rest of the background is made of scratch. I wanted to vector the trees, but I decided it was a bad idea so I stick with brushing instead. I hope the vectored characters blends alright with the backgrounds. The background is fabulous! You're the Goddess of Patience, I can't believe how well painted and full of details it is. You're right, vectored trees would've been too sharp for the smooth image. Great work! i think i comented on ap, anyway beautiful colors, splendid vectoring and i cant wait for you to submit the rest of your walls..
Hey I saw this on your AP account didn't I? Nice... What attracts me to it is the summery lighting shining through the sakura..which is really well-painted, in my opinion. I'm glad you didn't vector those too. ^.^ I like how the ground slopes, like a bowl, as if to signify something like continuity. The scene is really peaceful.. I like how fluid you have made the shine on their hair and robes.. I notice that there is a break in between the two sakura trees so I suppose that is to signify the differences between the two 'Kenshins'. Hmm... I know you say that the doubles and the significance of the scar is to show how the future version has accepted his past... but, I don't know, both of them look so peaceful and serene... ah well, I still love this wall! I will definitely fave! Wow, this is really really nice. I love the colors you used. Keep up the good work. Yeah I think the vector blend very well with the background. I love the vector and it's smooth lines art. About the meaning of the wall... well maybe red leaves on the left trees would have been more significant about kenshin's bloody past. But I'm not sure if I understand well your interpretation anyway. I love this! I want to download it, if I may? But I can't find the link. I'll favorite for now. I'm new BTW. ^^! I faved this before, and I still love it XD *remember pink broccolies* haha great job! This wallie is so lovely! It's soft, warm and feels really peaceful! This is an amazing wall. I love RurouKen. The background and the colors are awesome. The warm tone, although the sector works, but like, very soft feel! looks really good the 2 sides of kenshin! great wallpaper!